In case you were looking to make a few bucks while watching the most popular domestic cricket league in the world, IPL, look no further. With IPL 2018 in full swing, evenings are now all about sitting in front of the TV and watching the action unfold. The incentive for watching the league has always been the nail-biting finishes and the record-breaking knocks, but in its tenth year, IPL partners and apps are giving you more options to tune in every day to the game. Prediction games, quizzes and fantasy leagues are the new reasons to watch IPL every day. This year, both Hotstar and Jio, two of the most popular places to watch the game online are holding their own contests where you can win a lot of prizes. There are also dedicated apps to make your own Fantasy team which can rake in a lot of money. In case you were looking to make a few bucks while watching the most popular domestic cricket league in the world, look no further. Here’s your chance to redesign Google and win a MacBook Air! 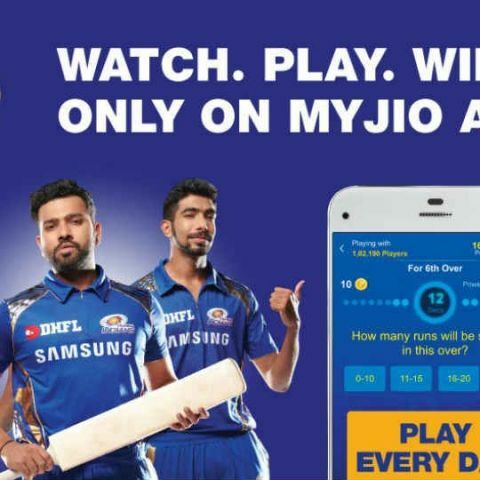 The Jio Cricket Play Along is a live mobile game that can be played using the MyJio app on both Android and iOS. The game is available in 11 langauges and is free to play. You don’t even require a Jio SIM card to play it. The game can be played once the match is live. Essentially, this is a prediction-based game where you predict what will happen in the next ball, or the next over. The game will ask you prediction-based questions and using you have to answer them by analysing the live match. Each correct answer will earn you points. There is also a Power Play mode to earn you extra points. The points can be redeemed to claim prizes. So far, Jio has not announced how to redeem points and how to win the prizes but the telecom company promises a premium house in Mumbai, 25 cars for each winner, cash prizes and additional data benefits. Download the MyJio app for Android here. If you watch your matches on Hotstar, the streaming platform also has its own contest running during matches. Like Jio, Hotstar too is offering a prediction-based game where you have to guess the outcome of the next ball to win coupons and prizes. If you play the game over a period of time, you will unlock new levels which in turn will give you more coupons to unlock. There’s coupons from Paytm, Yatra.com, Oyo Rooms, and Phone Pe offers. For more serious watchers, a Fantasy league is more of a challenge. Dream 11, as the adverts would suggest, is now one of the most popular fantasy league app in India. With over 2 crore players, Dream 11 offers prizes worth crores. Build your Fantasy team using your expertise and if your players perform well in the field on that day, you earn points. At the end of the season, the winner takes all.Dream 11 also gives you a Rs 100 joining bonus which can be used to gain an advantage over others. The offial hub of Indian Premier League also has its own Fantasy league which also rewards you with points that can be redeemed to win points. It works the same way as Dream 11 and all IPL players available to pick. But unlike Dream 11, you won’t get a joining bonus, but that just creates a level playing field for everyone. If cricket is not your cup of tea and you are still inclined to earn some free money off the internet without doing much, this new quiz-based game is perfect. The app hosts a trivia-based quiz at 9PM everyday. Players who survive till the last round wins money that is transferred to their Paytm wallets. Which is the best Bitcoin online wallet that is secured?How to mine it and earn?How to trade it for real cash? What is wallet in mobile?